Kismet Rubber Products is a leading extruder of custom parts, specializing in SBR extrusions. Water resilient and pill-resistant when at a low-durometer hardness, styrene-butadiene rubber is an option for environments with moderate chemicals and wet or dry organic acids. With over 60 years of experience, we have the expertise and application knowledge to manufacture reliable, high performance SBR extruded parts. Also known as Buna S, or Government Rubber-Styrene, styrene-butadiene rubber replaced natural rubber during World War II. Its compounded properties are similar to natural rubber. 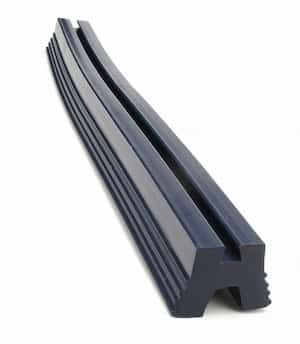 The ability to absorb vibration makes styrene-butadiene rubber ideal for use as dampeners or conveyor belts. It is also commonly manufactured into a variety of grommets, bumpers, appliance feet, U-channels, strips, cords and door seals, among others. Styrene-butadiene rubber is not recommended for exposure to petroleum oils, most hydrocarbons, strong acids or ozone. Incorporating fillers can help reinforce the polymer. With so many materials available, selecting the correct rubber for your application can be difficult. Find the best rubber solution for your process with assistance from Kismet Rubber Products. As an ISO 9001:2015 certified custom rubber extruder and service provider, Kismet Rubber Products strives to provide the highest quality rubber products to our customers hastily and at a competitive price.